A common security problem plaguing the oil and gas production companies in the booming South Texas oilfield is securing the many entrances to the thousands of active oil and gas leases. With multiple oil companies and associated vendors accessing these busy sites 24/7, security and site integrity can quickly get out of hand. In the past, the only means of providing log in/log out of vehicles and gate control was by use of costly personnel stationed around the clock. With the price of oil sinking to a 13 year low, oil and gas producers are scrambling to find ways to cut costs related to the operation and production of leases and related sites. With tough times in any market, though, comes innovation. And stepping up to meet the challenge to innovate in a difficult energy market is Security Technology of South Texas, Inc., with the “Virtual Gate Guard System”. The Virtual Gate Guard, using cloud-based video and access control technology, replaces costly manned gate guard services, and does so for a fraction of the monthly cost. In fact, Security Technology has been installing such innovation for various oil and gas producers and saving them hundreds of thousands of dollars per year at multiple gate entry locations throughout south Texas. One of the largest O&G producers in Texas reports savings of approximately one million dollars on an annual basis using this unique technology. The Virtual Gate Guard uses high resolution video cameras that connect directly to a remote 24/7 call center where video analysts view – in real time – drivers requesting entry to a property, lease or facility. Using a cloud-based intercom system, the driver communicates with the security center and are “logged in” with the same information as a physical guard would collect. The gate is then remotely opened and the driver enters the property, without ever having to leave the vehicle, creating a safer environment for the driver and smoothly logging in and moving all drivers onto the property. Since the system can be installed for no initial investment, the company only pays a monthly fee, which is a fraction of what they were paying for a guard service, and the savings is realized immediately. 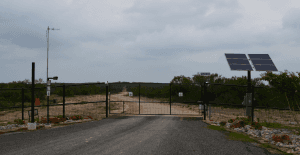 For more information on the Virtual Gate Guard System contact Security Technology of South Texas, Inc. at 210.446.4863. Or to learn more go to www.gostst.com.